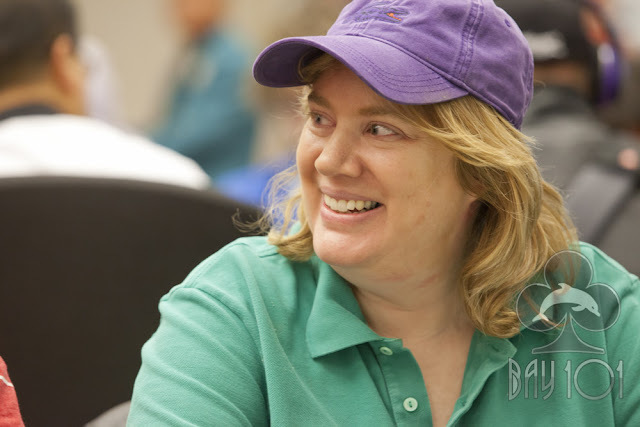 Kathy Liebert was all in for 92,000 with A-Q against the [Ac][Tc] of Men "The Master" Nguyen. The flop fell a brutal [Ts][9c][8c], and the club on the turn sealed Kathy Liebert's fate. She will be the "bubble girl," and the remaining 36 players are now in the money. The field has redrawn for seats at six 6-handed tables and will continue playing 2,500/5,000 blinds with a 500 ante.